Women experience all sorts of symptoms and changes in their bodies before and during the menstrual period. Lower back pain during periods can be frustrating, especially because many women don’t know why they feel discomfort in that area. In fact, 9 in 10 patients with lower back pain don’t know the cause, but understanding underlying mechanisms allows you to cope with the symptom more effectively. To help you alleviate the pain before and during the period this post is going to elucidate the reasons behind it. Keep reading to find out why you experience lower back pain during this time of the month. Why do you feel Lower Back Pain During Your Period? In many instances, lower back pain during the menstrual cycle is a part of premenstrual syndrome (PMS). As a woman, you already know that PMS is defined as a group of emotional, physical, and behavioral symptoms occurring before the menstrual period. Generally speaking, symptoms of PMS occur one to two weeks before the period itself and their severity varies from one woman to another. PMS is a common concern for women and according to US Department of Health and Human Services, about 85% of menstruating women experience at least one symptom during their monthly cycle. While a vast majority of these women report fairly mild symptoms that don’t require treatment, about 3-8% have severe PMS. Interestingly, Japanese scientists discovered that participants who were overweight and those with breast tenderness had a higher risk of experiencing lower back pain during periods. On the other hand, having three or more children reduces the risk of pain in this area. They concluded the study explaining that reproductive symptoms and menstrual disorders influence the likelihood of developing lower back pain during this time of the month. 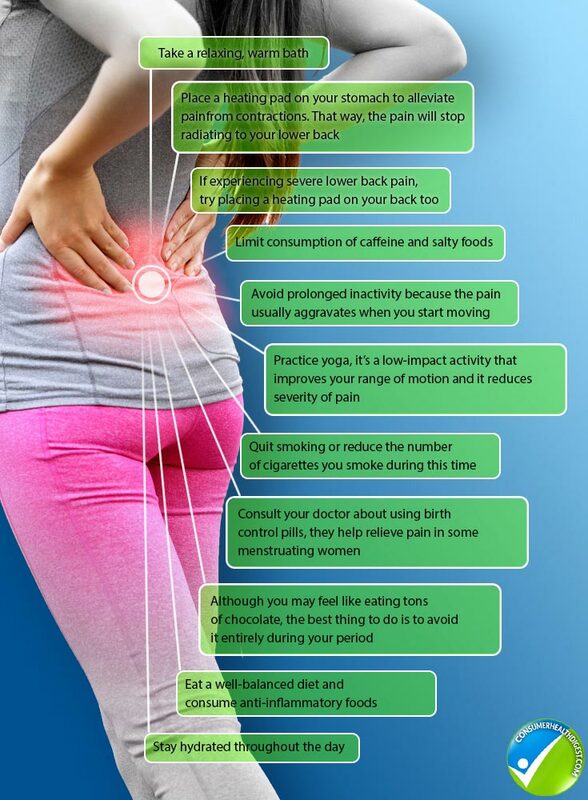 What Causes Lower Back Pain Before and During Periods? Now that we’ve covered PMS, let’s move on to some other reasons why you experience lower back pain during the menstrual cycle. Pain in the lower back area during the period can also occur due to primary dysmenorrheal, cramping pain in lower abdomen occurring just before or during menstruation. Basically, it is a contraction of the uterus with 90% prevalence according to the American Family Physician. Each month a woman’s body builds up endometrium, a thick uterine lining in order to prepare for a fertilized egg. If you don’t conceive, levels of estrogen and progesterone decline and send a message to the body it’s time to break down and detach the endometrium. The body starts working immediately and does this job by contracting. Sometimes uterus starts contracting too strongly and you feel the pain in both lower abdomen and lower back area, some women also feel the pain in their thighs. As uterus contracts, it puts pressure on nearby blood vessels and cuts off the supply of oxygen to the surrounding muscles. In turn, the pain occurs. Generally, lower back pain caused by contraction of the uterus isn’t dangerous, it’s a normal process that occurs in your body every month. However, if you experience severe pain that affects your daily functioning or the symptoms change, it’s recommended to schedule an appointment and see the doctor. You may also opt for pain relief products. Have a glance at HondroCream Review, as it may relieve lower back pain and all associated symptoms. What Helps Lower Back Pain During the Period? Even though back pain during the menstrual cycle is a frustrating problem, it’s not impossible to ease the pain and prevent it from affecting your daily activities. Of course, the first line of defense involves intake of over-the-counter anti-inflammatory drugs like ibuprofen. 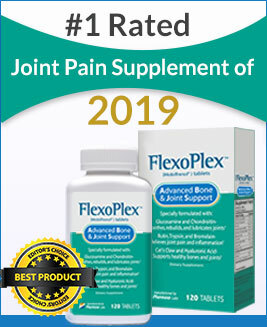 If you deal with this kind of pain every month, make sure you have these pills in your medicine cabinet and take them as soon as you experience discomfort. Ibuprofen is a better choice than acetaminophen because it is primarily formulated to relieve inflammation. Besides medications, various exercise therapies prove to be effective for the functional recovery of the musculoskeletal system in women who experience menstrual pain. Strive to be physically active and avoid a sedentary lifestyle. A useful thing to do is to work with a personal trainer who will create a customized plan of exercises that will help you prevent and alleviate the pain. It is not uncommon for menstruating girls and women to experience lower back pain during periods. The intensity of pain varies from one woman to another and it usually occurs as a consequence of uterus contraction that causes pain in the abdomen and radiates to lower back. Taking anti-inflammatory medications is a recommended approach as well as warm baths and applying heating pads on painful areas. You can explore Move Free Ultra Review which might be a decent choice for anti-inflammatory medicine. If you notice a change in your symptoms, consult a doctor.